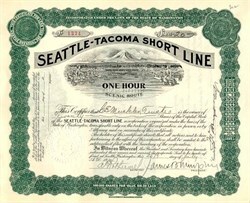 Beautiful certificate from the Seattle - Tacoma Short Line issued in 1910. This historic document was printed by General Litho Company and has an ornate border around it with a harbor view vignette of a train passing in front of Mount Rainier with two women holding up the bridge for the train. Below the vignette it says "One Hour Scenic Route". This item has the signatures of the Company's President, James B. Murphy and Secretary, A. Rothermel and is over 104 years old. The certificate was issued to and signed on the back the Trustee, C. E. Mucker. The company was organized in 1907 to build a railroad from Tacoma to Seattle.